* Dye my hair in pretty colors A few years ago I used to have super cute pink and black hair! Lately I was taking a look at old photos and I found this one! *_* Omg I fell in love again with pink and black hair! I wanna do it again and maybe try a new color like orange/green/blue! Do you use any crazy dye? Let me know what brand you use! * Write more on the blog I admit, this year has been hard to me! I had to re-organize my life! * Spend fun times with Alessandro My baby boy is almost 1! And he is starting to do fun stuffs like trying to walk alone, he talks a storm and makes new things everyday! I want to spend fun times with him, take walks, visit funny places... What do you with your baby in your spare time? * Update the shop more often I always have amazing ideas for my shop but I'm always too lazy to make it real! This year I want to sew more and put my creations on my shop! * Read more I'm not a big reader... actually.. I'm not a reader at all (LOL) This year I'd love to read few books... My problem is: I need to be sure I will like the book or I don't even start reading one... so feel free to reccomend me some interesting books! * Take more pictures with my Canon Since I bought my IPhone, I almost forgot about my Canon! That's BAD! The thing is that I always take pictures of Alessandro and he never makes poses, I always take pictures of him while doing something fun so I don't have time to run, take my Canon and go back to him... It takes too much time XD so my Iphone captured this year of our life and I'm thankful for that BUT this year I want to try and take more (better) pictures with my real camera. * Blog about my outfits I often posted pictures on my Instagram (by the way I'm momoko_art if you want to follow me) of my outfits and people ask me where my clothes are from, so in 2013 I'll post some of my outfits with links to the shops! Cool isn't it? I love when I read blogs and bloggers post links of where to find cool items! * Print with Gocco I have my Gocco printer from a few years and I never use it! I have tons of inks so this year I want to use it more, maybe to print free cards for my customers! * Have a romantic date with my man once a month With the help of my parents (who often take care of Alessandro), my love and I could make it possible!!! * Take care about my nails Yes! I love nail art and I used to have fun with some cute nail stickers (you can see here, here or here) but lately my nails are very weak and they break often! (any tips of making my nails stronger?). 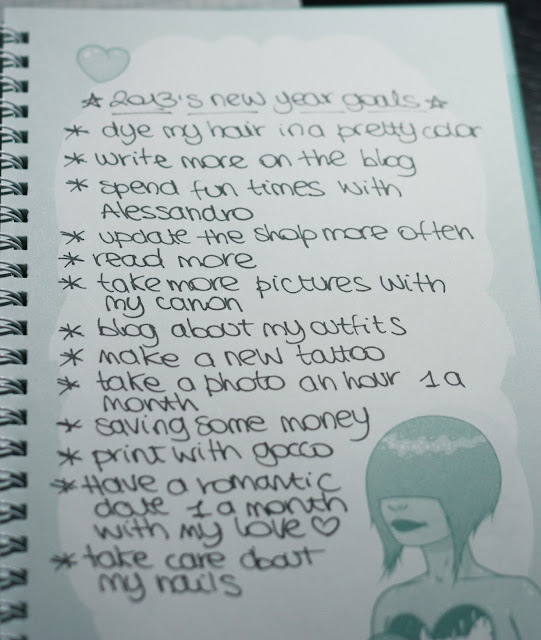 How about you, what are your 2013 goals? Uff pure io devo dimagrire -_-"
Ciao Momoko =). Che bello il renew del tuo blog e che belli i post, mettono allegria. I buoni propositi per il 2013... SAVING MONEY senza dubbio ahahah e magari bloggare di più!